The Year 7/8 Science Club started the new year by filling their lungs with fresh air and making a clean sweep of the beach under Guernsey’s Castle Emplacement. 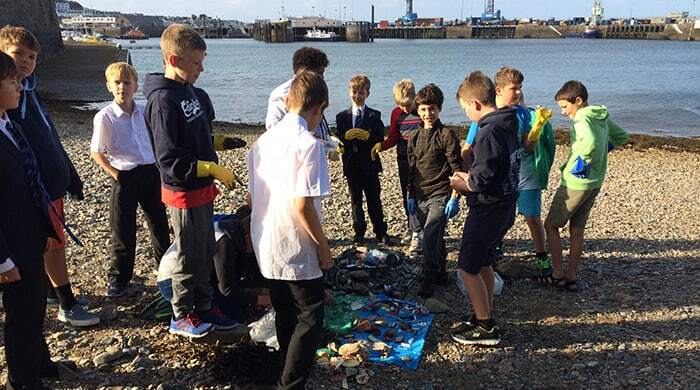 The 24 boys and 2 staff assisted Mrs Vanessa Adams in conducting an international survey, attempting to quantify, analyse and remove human rubbish, jetsom and flotsam from beaches, in this case that adjoining Castle Cornet. From slabs of concrete, through fishing tackle, bottles and sea glass over a thousand articles were noted and removed. A state of symbiosis was reached between boys and beach, the latter being returned to a pristine state, the former enlarging their collections of sea glass and unusual knick-knacks. The discovery of a long oily chain was however too much for the adults – who deemed this material for immediate recycling, especially when new white shirts were within range of grubby hands.